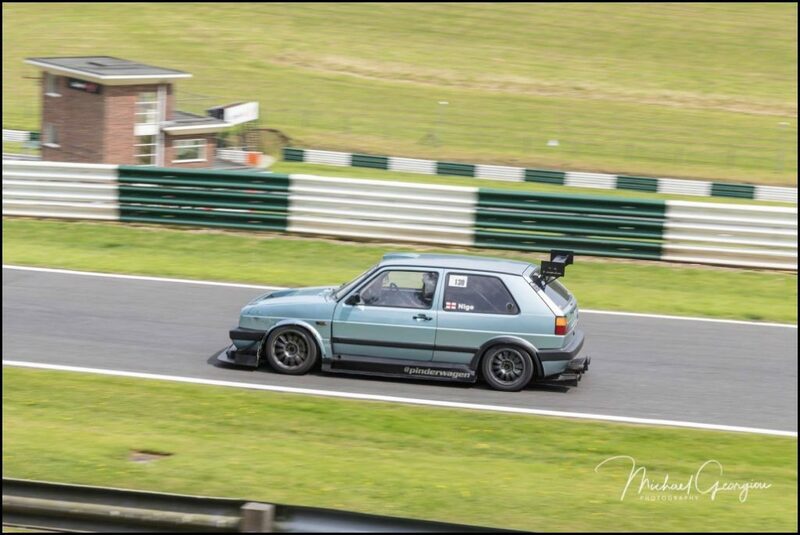 Whilst Cadwell Park isn’t my closest circuit, it’s only a couple of hours away and midweek events are pretty cheap even in the summer. As I work shifts I regularly work weekends but I am free mid week so this worked perfectly. I’d picked up the new X5 yesterday, driven it home and then towed the Golf across to Cadwell this morning. Blimey, I thought the old X5 towed well, but this is even better ! The adaptive cruise control makes motorway towing an absolute breeze. Arrived in plenty of time, unloaded and signed on well before the briefing. Callum is a colleague from work and was a keen biker until an accident last year. He was curious about the whole trackday thing from listening me keep going on about it and so I picked him up on the way and he joined me as a passenger for the day. 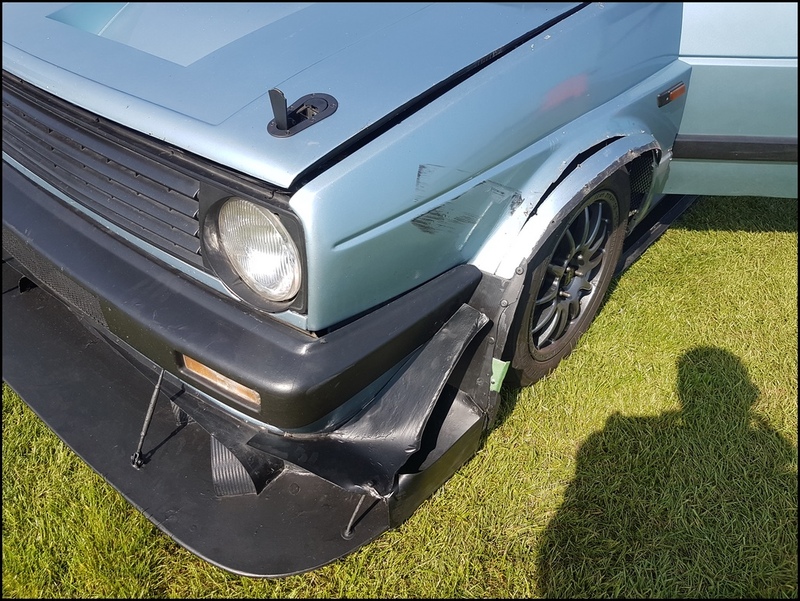 The briefing was by MSV and a particular comment turned out to be quite prophetic.”Mind the floppies, they aren’t very floppy….” They are the vertical markers they use instead of cones to stop people driving onto Mr Palmers grass. Noise testing was a simple affair, I know the Golf is way under the limit and I didn’t even fully warm the exhaust before going to be tested. If it is a venue I’m concerned about, I let the system warm up fully, it always quietens down a touch when it is warm. Out for the sighting laps, quick check under the bonnet and back out again for a 6 lap session to get the tyres nice and warm. No issues at all and Callum was grinning. Straight back out after dropping the tyre pressures and I started to push. I was trying the 17″ slicks again, this time I had 9J and 8J 17″ Team Dynamics rims to see which I preferred before buying more wheels. 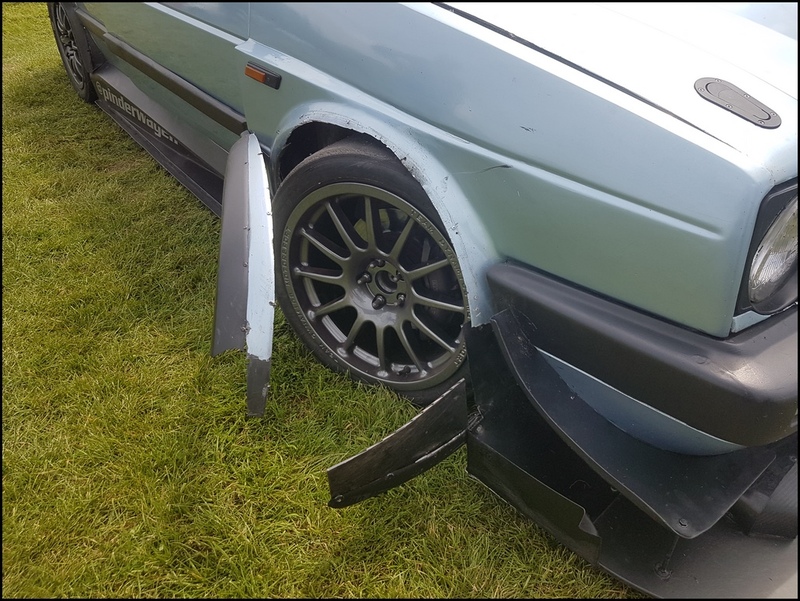 The steering is much sharper than before and when I turned into Coppice the car hugged the left kerb and I skimmed the floppy. Thinking nothing of it, I came round the next lap and spotted the wheel arch cover laid at the side of the track. Returning to the paddock I was gobsmacked at the damage. 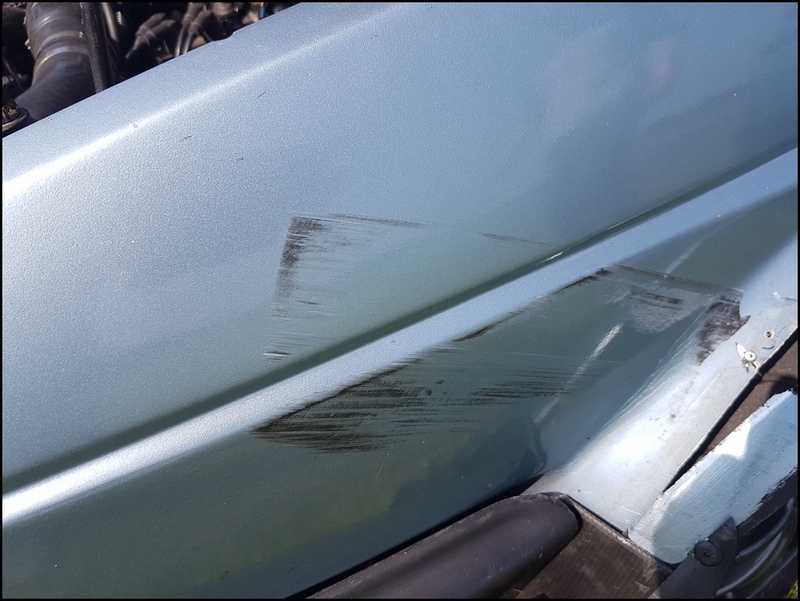 The scuff on the front wing shows where the top of the floppy made contact. 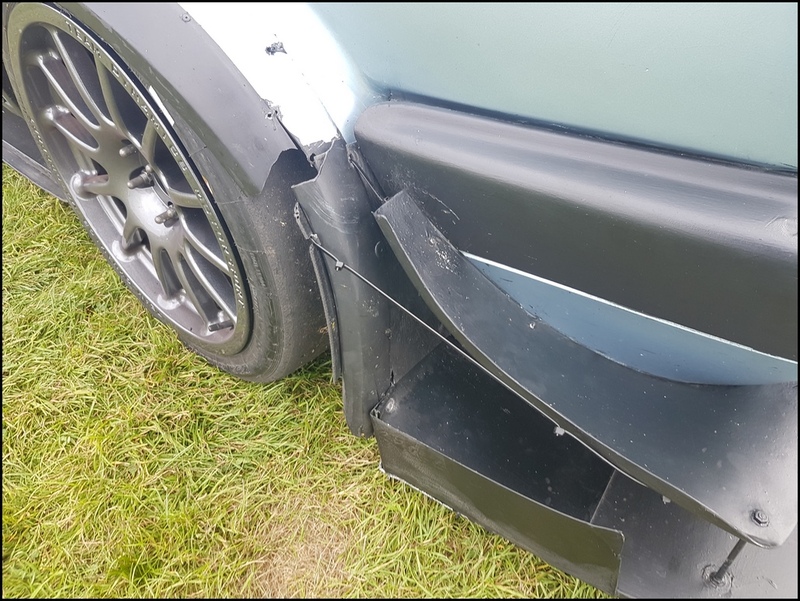 Whilst it was only a small touch, it had bent the aluminium canard, broken off the vertical fence, marked the wing and smashed off the wheel arch extensions !. I was able to straighten the canard and secure the wheel arch. Callum helped fit the 8J wheels on the front, these give the tyres a bit more flex and I was hopeful they’d soften the steering response a little. Yeah, so that didn’t go so well either. Whilst the steering was certainly much more manageable, I was still driving on instinct. Going through Hall bends I know how much to turn the wheel, the problem is that all my previous laps required more steering angle. Today I added the same angle and it was far too much. The car grazed the floppy AGAIN and I was black flagged. The front wing was looking even worse. Right, come on Nige. You’ve done enough trackdays that you can drive without hitting the floppies. What are you playing at ! After giving myself a stern talking to I went back out for a trouble free session. 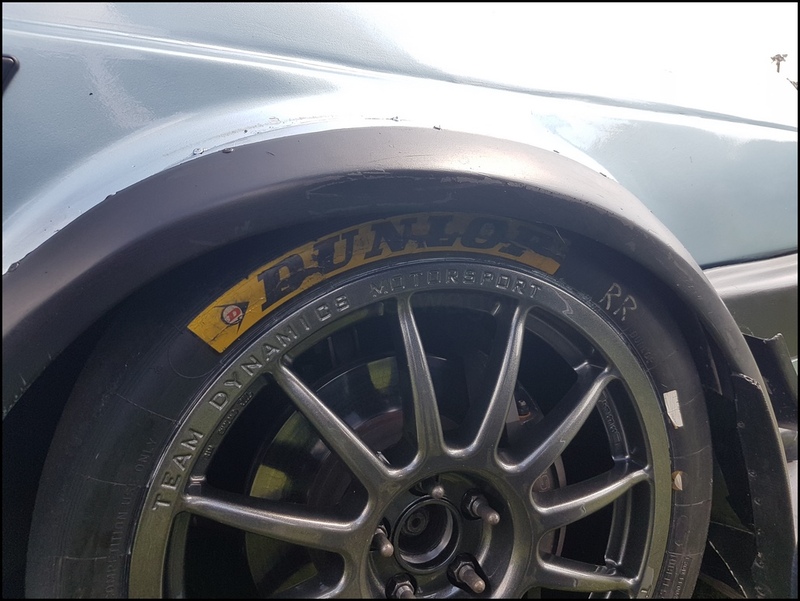 The front end felt brilliant and the larger tyres, whilst making the gearing a little but taller were managing many more laps before any signs of overheating compared to the 15’s. I was starting to relax a little and get used to the much more responsive front end. After dropping the tyre pressures a little we went out and this time I hit the floppy on the right entering Hall Bends. That caused a Red Flag whilst they refitted the floppy and a deserved bollocking from the Marshall. The fibreglass was certainly losing the battle with the floppies. Secured the wing with cable ties and a bit of gaffer tape. It was looking pretty scruffy by now and I knew I needed to stop hitting those floppies. Not only was it damaging the car, but I would end up getting sent home. Callum understood what was happening, I`d been explaining the difference as we were driving and showing how the steering was so responsive. Steve was there in his Caterham and offered to take Callum out for a session. 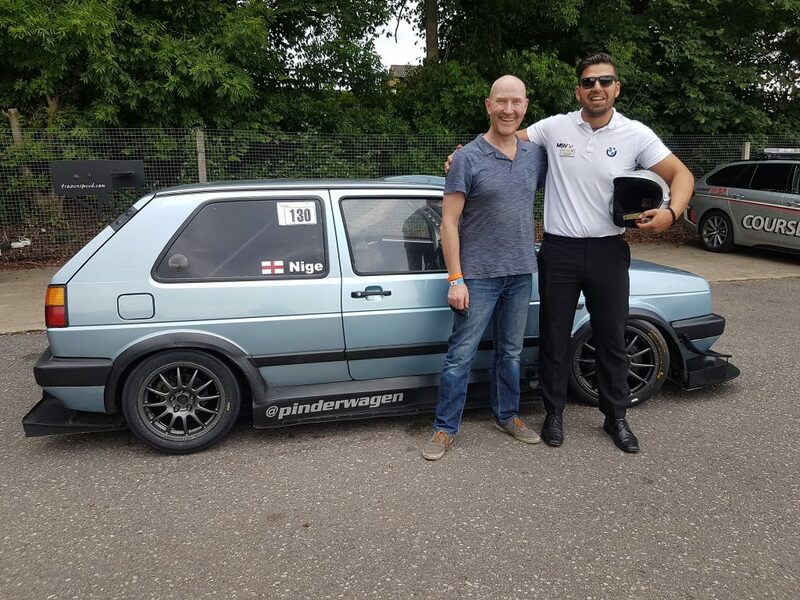 This was a great idea, as an ex biker it would be the most engaging experience for Callum he could get in a car and I had a feeling he`d really enjoy the laps. I wasn’t mistaken and he came back in with a big smile on his face, the raw nature of the Caterham resonated with him. Marc Kemp was instructing on the day and he`s never been out with me before even thought we`ve spoken. He knows about the Golf and was interested in getting a session in the passenger seat. After strapping himself in he commented how comfortable and secure the seating position in the Golf was compared to many cars. He`s a tall bloke and I suspect he can’t always sit low enough. Then we went out and I drove badly. Perhaps badly is too strong but I was pretty scruffy for the first couple of laps before I calmed myself down. I thought I’d got over being intimidated by some instructors but apparently not. Nothing Marc said made me feel uncomfortable, quite the opposite actually. He was enjoying the laps and making the odd comment after he had watched my driving for a few laps. His line through Barn onto the start/finish straight made a big difference. ! No, he isn’t nearer to the camera, he’s that big ! Once past I was able to go quite a bit quicker although I totally misjudged how slow the Clio was going approaching the Gooseneck A definite difference without a passenger both in braking and accelerating. Perhaps I need to do the odd lap by myself more often. ? Then it was time for lunch. Not only did it give me chance to have a chat with the other guys who were there, but I could have a proper think about my driving style and what I needed to change. 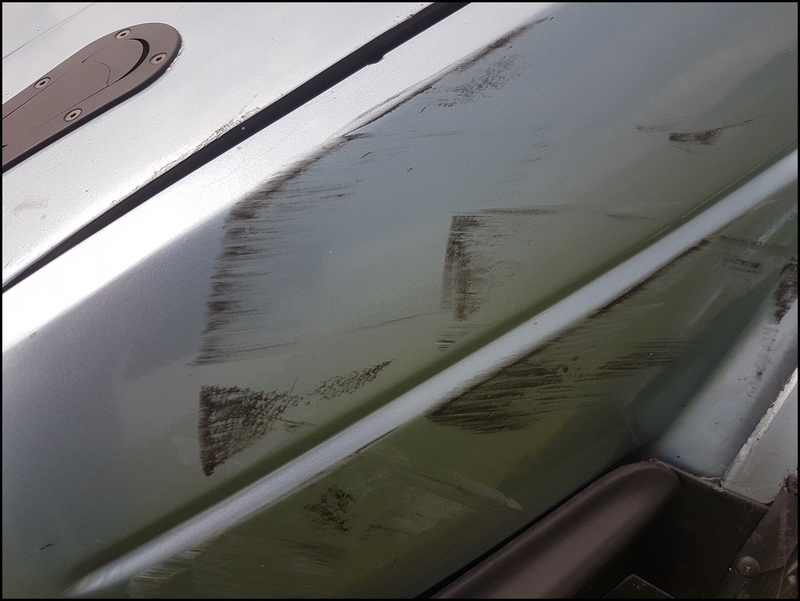 I had been discussing about the Contour that hadn`t been looking in the mirrors and explained I would have a quiet word with the driver after lunch. Just then 2 chaps wandered over and one of them heard the conversation. It turned out that it was his first ever time in this particular car after driving and racing in others for many years, he was concentrating so much on not going off circuit that he didn’t pay enough attention to his mirrors. He was extremely apologetic which only encouraged more mickey taking. I took him out for a session later and there were certainly no hard feelings. Some drivers have an ego and see it as an attack on their manliness if you overtake them Jeremy is wise enough to know there is always someone faster than you and just let them past and enjoy your day without getting all stressed about it. 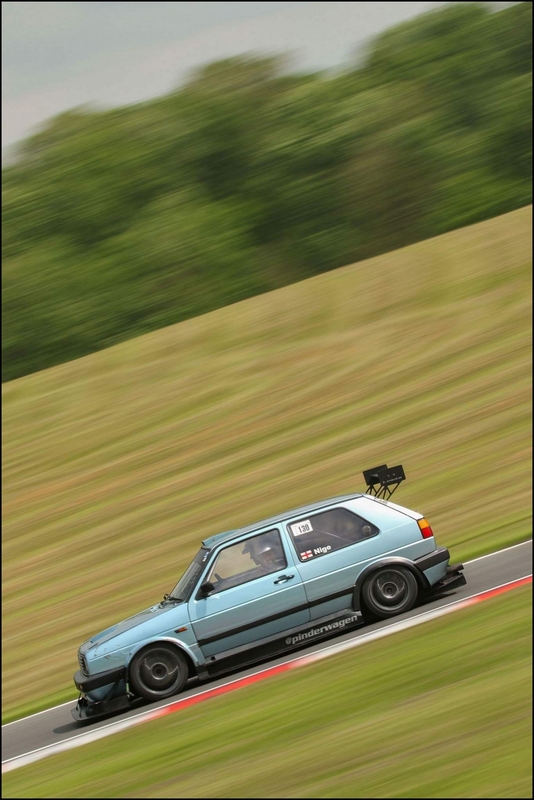 When I first drove Cadwell way back in 2007 the Golf was almost standard. 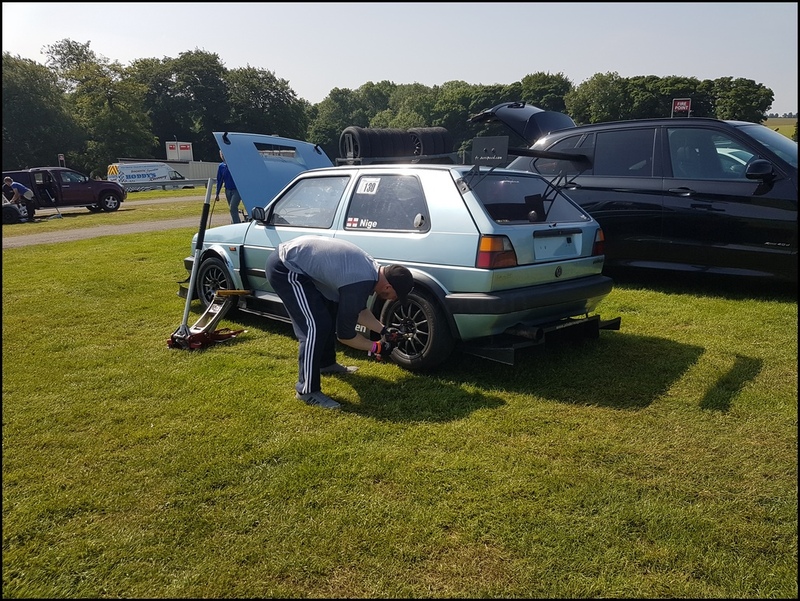 Gary (GVK) was tracking his well developed MK2 VR6 at the time and I learned a lot from his selfless sharing of information over the years. 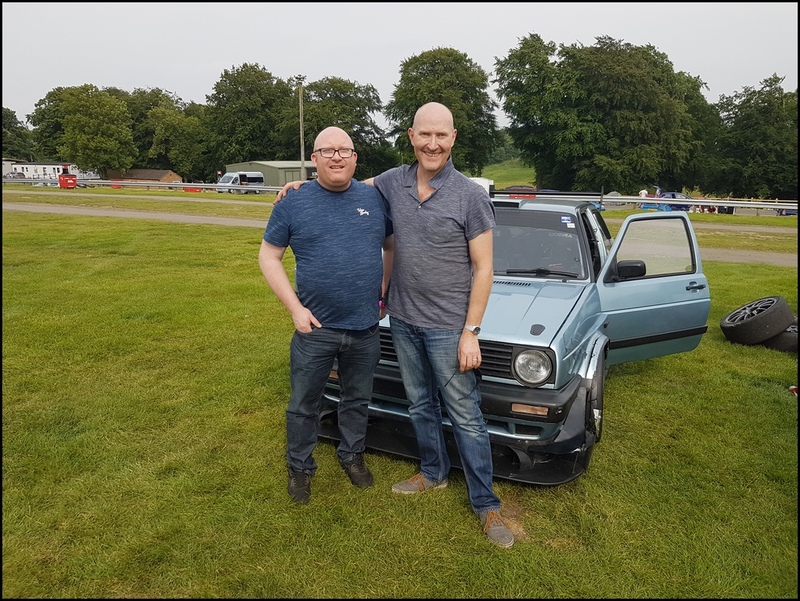 Sadly his MK2 is long sold and he doesn`t do trackdays anymore but he did drive up to Cadwell to say Hi. 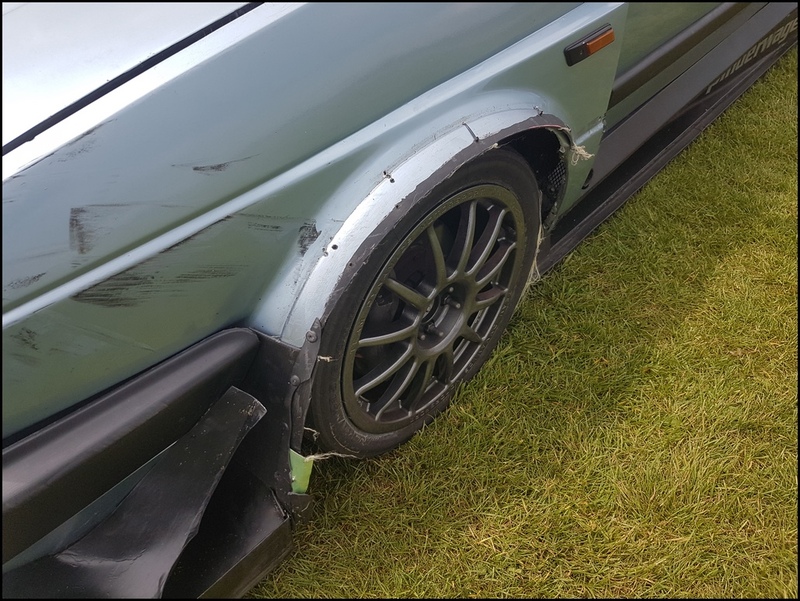 He had’s signed on so I suggested he get a passenger band and I’d take him out whilst Alex took out Callum in the E36 328. Lap 1 and we entered Coppice and I heard a muttered “F####g Hell !! ” from Gary as we went up the hill. 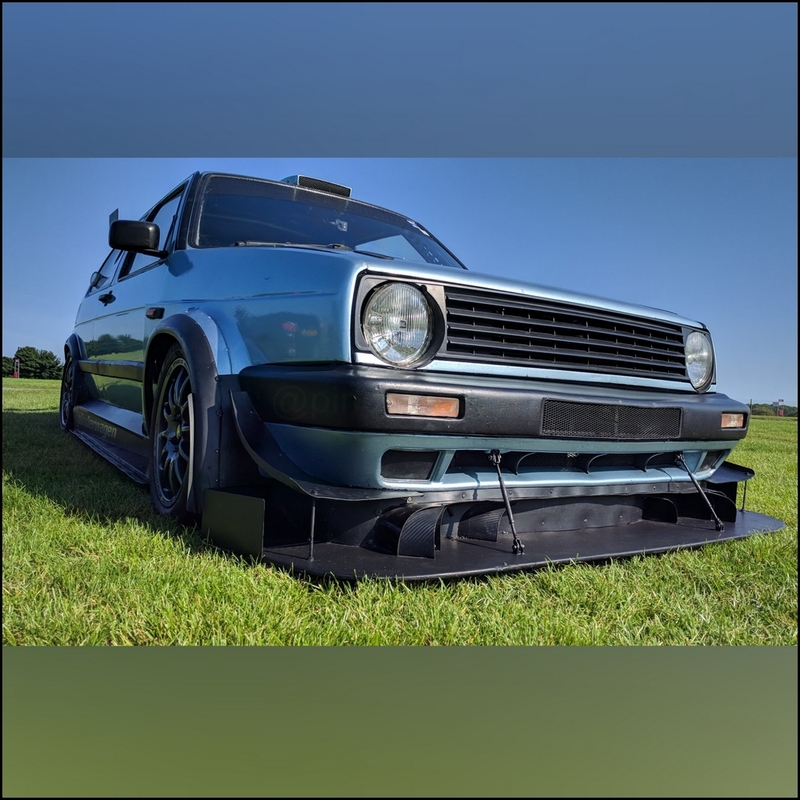 I take it for granted how my MK2 feels through quick corners and carry speed with no concerns. 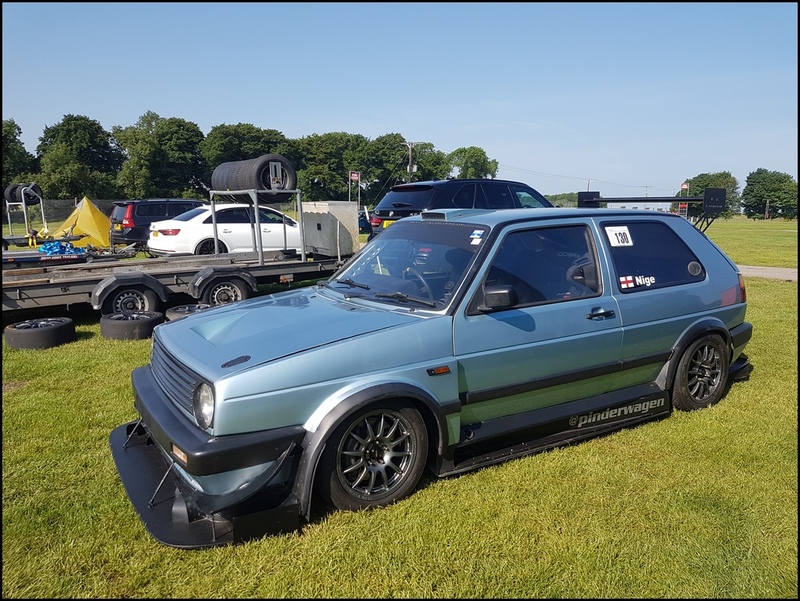 Gary was used to a MK2 with no Aero and less developed handling. To say it was a bit of a shock to his system would be an understatement My intention wasn’t to scare him but the pace of the Golf shocked him much more than I expected. Even after the laps he kept mentioning in how stable it felt at speed. Not only was it great to see him again but it was a pleasure to be able to take him out for a session even though he kept looking at me and the Golf after the session and muttering “f#####g hell ….” to himself. By now we were getting close to the end of the day and I had a really good handle on the steering and response of the front end. The 8J’s felt a little bit more compliant and I suspect that’s what I will end up going for. The 9J are dished and certainly look better but they make the sidewalls so stiff that I didn’t enjoy driving it as much. It required too much concentration. That sounds daft, I always concentrate but the 9J moved the car around a lot more over bumps and when accelerating. I dunno, it’s hard to explain but the whole driving experience wasn’t quite as enjoyable. The car itself didn’t have any other issues and I only needed to top up the fuel. As a short notice midweek trackday, this was just what I hoped. I was able to lap all day, in between the repairs from contact with the floppies and felt much more comfortable with the 17″ wheels. A few cosmetic repairs required but nothing mechanical which is fine.